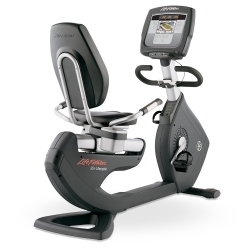 The 95R features a comfortable seat with improved thigh clearance, your choice of deluxe armrests* or side handlebars, and at-your-fingertips resistance controls enhance the comfort of every user on every fitness level. And the improved pedal strap adjustment makes it easier to get on and start working out. Also, with the Life Fitness commitment to biomechanics research, the Recumbent bike easily accomodates a wide range of body types.